Following an invite from Belarus Tractors’ North American importer, MTZ Equipment, we travelled to Belarus to get first-hand experience with a radical electric drive concept. James Rickard reports. Not quite the finished article, production models will get new bonnet styling. With the promise of virtually zero maintenance, easy operation and high efficiency, Belarussian tractor maker Belarus has taken the bold step and developed an electric drive transmission. Though known in the UK, and around the world, for its simple, robust tractors, Belarus is no slouch when it comes to innovation, claiming to be one of the first in the industry to offer factory fitted four wheel drive systems and cabs. And although the use of diesel-electric powertrains is not a new concept, used for decades in trains and mining vehicles, this latest concept from Belarus is a world first for agriculture. On average, the manufacturer says the electric transmission offers up to 15 per cent fuel savings during cultivation operations and up to 30 per cent for transport applications. Surprisingly, the biggest drive for the manufacturer to develop such a transmission was reliability, with the transmission said to have a maintenance-free life span of at least 30,000 hours. Although the project was started in 2006, the brushless motor technology had to mature to become price competitive for agricultural applications, says the manufacturer. Between several test machines, about 20,000 hours of field testing has been completed so far. Initially, the transmission will be available on the firm’s 300 and 350hp models, the 3023 and 3623 respectively. However, Belarus also has plans to introduce a full line of electric drive tractors from 150hp upwards. Currently, the tractor is powered by a Stage 3/Tier 3 compliant Deutz engine, making it only available in less emissionised countries. For places such as Europe or North America, it is looking into various engine options, which will meet emissions standards. These include Caterpillar, which it already uses in its high horse power tractors, and options from Mercedes and Cummins. Prices are expected to be in the region of £206,700 (US$290,000) for a 360hp version, with availability from this September. To keep costs down, Belarus has stuck with a proven product, in this case its 300 and 350hp tractor models, and essentially replaced the powershift gearbox with an electric generator and a brushless motor. Apart from two gears offering high and low ranges, 0 to 20kph and 0 to 50kph, everything else remains the same, including the final drives and hydraulics. Other options where considered, including the use of individual wheel motors, but this concept was deemed to be too costly to produce, with question marks over reliability. In creating the electric transmission which offers infinite speed adjustment, the manufacturer has effectively come up with an alternative to a conventional hydro-mechanical continuously variable transmission. 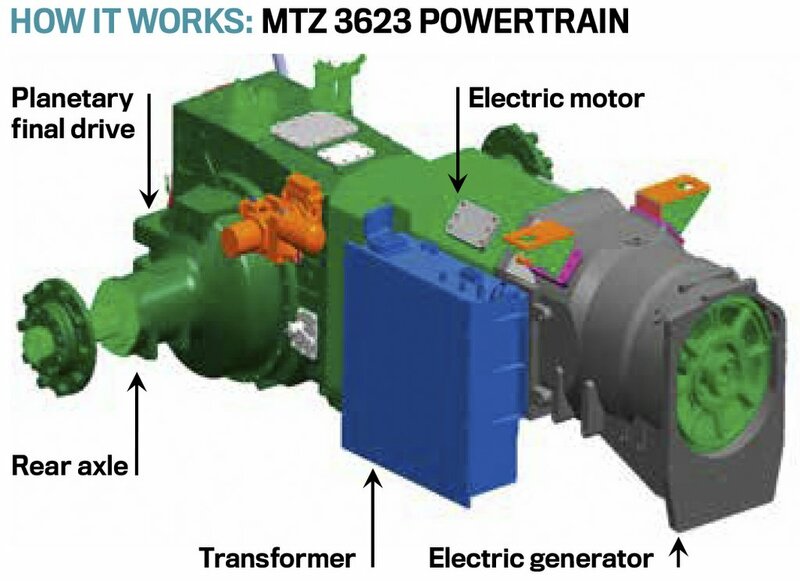 Significantly though, with only a generator and a motor, the transmission features far fewer moving parts and components compared to a powershift or a conventional CVT - it only has clutches for the pto and four wheel drive. Generators and motors used are also said to be industry standard units, made by a Russian company. Both Chinese and European alternatives were tested, with the Russian-made components found to offer the best solution in terms of tractor integration and control. Just like a conventional CVT, the electric driven tractor operates in exactly the same way, with the engine producing just enough power and rpm to satisfy the demands of the transmission, based on the control input from the operator. This sees either a pedal or a joystick used to alter speed, with the tractor working out the best combination of engine revs and transmission speed. By using electric drive, both start-up and working torque of the final drive is increased, says Belarus. Also, the transmission is claimed to offer more than 87 per cent power transfer across a greater range of forward speeds compared to a hydro-mechanical CVT. This, says the firm, effectively gives it the same pulling power as a 420hp equivalent powershift model. As well as impressive power application, the transmission has also been designed to provide electrical resistance when slowing down, giving up to 20 per cent extra braking capacity. Cruise speeds can also be set, and it features a manoeuvring speed function, making implement hook up easier, says Belarus. In addition, controls on the rear mudguards allow you to move the tractor forwards and backwards. Helping control the tractor on hills, it also features a ‘hill hold’ function. Following four seconds of brake pressure when stationary, just enough current will run through the motor to ‘hold’ the tractor in place. When ready to move off, just hit the accelerator. To enable trouble shooting, should any occur, the manufacturer is also providing self-diagnostics software. This allows all critical parameters to be monitored and checked including temperature, current and voltage, along with the ability to diagnose any problems. Cleverly, by starting in the ‘middle’ of the tractor with the transmission, it gives Belarus the option to further develop the tractors’ power unit at the front, or develop the rear of the tractor to either offer the ability to electrically power attachments, or completely redesign the powertrain itself using individual wheel motors. An initial option for the tractor will be a stationary invertor, which will allow the tractor to be used as a generator. Offering a 230V, three phase, 270kW, AC output, the firm suggests the invertor could be used as power back-up on the farm, or be used to power stationary equipment such as augers and elevators. Building on this idea, an invertor could also be mounted on the tractor which would allow power to be supplied to implements, such as large fans on drills and the gearbox of a diet feeder, for example. This would also have the benefit of more control over rotational speed - in the diet feeder’s case it would allow for a soft start. In addition, the wheels of a trailed implement could also be powered, giving extra traction and less soil damage. Other elements of the tractor could also be electrically driven in the future such as ptos, compressors and hydraulic pumps. The firm is already looking into an electrically driven front pto and radiator fan. It could even do without a starter motor, using an inverted current in the generator to start the tractor. Further down the line, the engine could be swapped for a battery, or a combination of a smaller engine and battery could be developed, says the company – offering the potential for energy recovery during transport applications, and zero emissions. To get a flavour of the transmission, we tried out a pair of the firm’s 3023 test tractors. Operation is certainly simple, and anyone used to driving a conventional CVT will quickly get their head around it. Communication between engine and transmission was better than expected, with impressive response to throttle input and changing gradients - better than some hydro-mechanical CVTs. Despite no mechanical connection between final drive and engine, you would be hard pressed to feel any sort of ‘elasticity’ in the transmission. Unfortunately, the test models had no engine or transmission braking – something which is to be added to production models we understand. We also cannot comment on range change characteristics, as the test models only had a mechanical shift, although this was effective and simple. This is to be electric shifting on production models. Shuttling, however, was impressive, with quick and smooth direction changes afforded by a simple reverse in motor polarity. Although the tractors driven were test units with 5,000 hours on them, the main thing which needs addressing is refinement. To make them more appealing to Western Europe and North America, we would suggest the look and the control interface are the main areas which need developing. This, and filtering out some of the high-pitched transmission noise. Overall, the diesel- electric concept is spot on. It is good to see a less mainstream manufacturer taking the fight to the big boys with an innovative product. And unlike the big boys which are ‘dabbling’ in electrification of tractors and implements, Belarus is actually putting something into production.